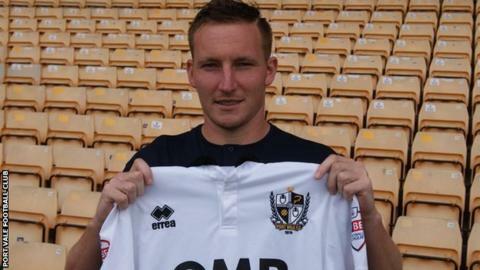 Port Vale have signed a second loan striker inside four days by bringing in Frenchman Achille Campion from Swedish Division One side Norrby IF. The 23-year-old 6ft 2ins target man has signed a short-term deal, subject to international clearance. Campion, who was on trial with Bradford in July, also had trials with Sheffield Wednesday, Yeovil and Ipswich Town. He follows boss Micky Adams' signing of Jordan Slew on loan from Blackburn Rovers on Friday. Vale started the season brightly, Tom Pope hitting five goals in four games, but they are now 18th in League One. They have lost their last three matches in all competitions - all three of them at Vale Park. Slew, who came on as a substitute in Saturday's 2-1 home defeat by Chesterfield, and Campion are now likely to figure in Saturday's trip to Peterborough.